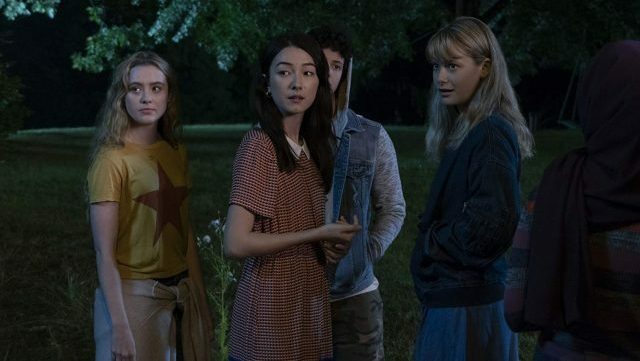 Netflix has released the teaser trailer for their forthcoming young adult drama series The Society, featuring our first look at the chaotic world where teenagers can do anything they want to do as their parents mysteriously disappear. Starring Big Little Lies‘ Kathryn Newton, the 10-episode series is scheduled to premiere on May 10, exclusively on Netflix. Check out the video below! Written by Chris Keyser (Party of Five), The Society is described as a modern take on 1954 Nobel Prize-winning story Lord of the Flies. It follows a group of teenagers who are mysteriously transported to a facsimile of their wealthy New England town, left without any trace of their parents. As they struggle to figure out what has happened to them and how to get home, they must establish order and form alliances if they want to survive. The series stars Newton as Allie, Rachel Keller (Legion, Fargo) as Cassandra, Gideon Adlon (Blockers, Mustang) as Becca, Jacques Colimon (Duat) as Will, Olivia DeJonge (The Visit) as Elle, Alex Fitzalan (Slenderman) as Harry, Kristine Froseth (Sierra Burgess Is A Loser, Apostle) as Kelly, Jose Julian (A Better Life, Shameless) as Gordie, Natasha Liu Bordizzo as Helena, Alex MacNicoll (Transparent, Backseat) as Luke, Jack Mulhern (Locke & Key) as Grizz, Salena Qureshi (Madam Secretary) as Bean, Grace Victoria Cox (Heathers, Under The Dome) as Lexie, Sean Berdy (Switched at Birth) as Sam and Toby Wallace (Romper Stomper) as Campbell. The series is co-created and executive produced by Keyser along with director Marc Webb (500 Days of Summer, The Amazing Spider-Man). Keyser will also serve as the showrunner while Webb will be the series’ director.